Click township to go to cemeteries. Allen County has over 147 cemeteries in its twenty townships. Only Jackson Township has no known cemeteries. We have a Google map of cemetery loctions on each township page link above. 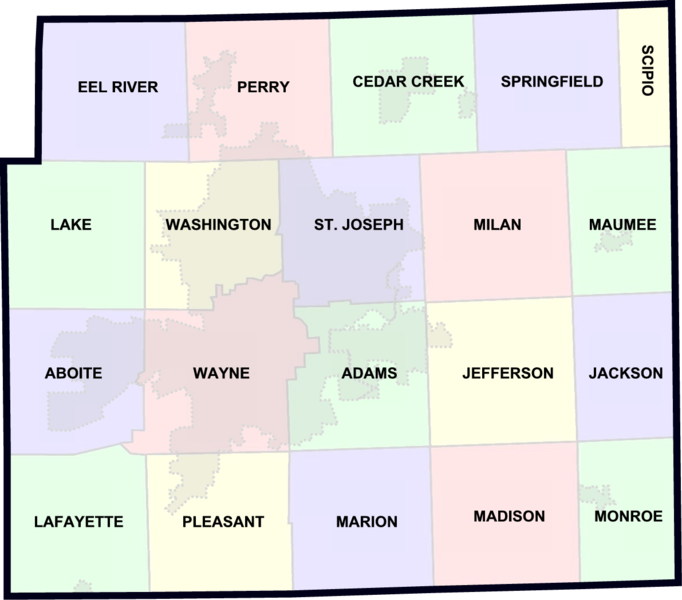 In October 2014, the DNR - Indiana Department of Natural Resources SHAARD GIS map only shows 112 of those cemeteries. ACGSI has an every-name index the Cemetery Index, Allen County, Indiana from their 1980s cemetery readings then updated by the local DAR 2008 project to photograph all tombstones for their pages. Our Cemetery Name Index page lists every known cemetery name linked to DAR tombstone photos, Find A Grave pages, and when available newspaper articles and other information found online. A military cemetery between what is now E. Main (formerly Old Fort Place), Clay, E. Berry and Lafayette Streets next to the 1794 Fort Wayne, demolished in 1800, is shown on a map on page 139 of the book The pictorial history of Fort Wayne, Indiana : a review of two centuries of occupation of the region about the head of the Maumee River by B. J. (Bert Joseph) Griswold. Many Allen County cemeteries started in the 19th century as small family plots on rural isolated farms, or as rural church burial grounds. Families often moved away, or after a couple generations the descendants learned little to nothing of their family history beyond their parents or grandparents. Some churches disbanded, moved or merged with other church congregations. Many of the earliest small cemeteries were moved to nearby cemeteries, or larger city cemeteries like Lindenwood and the Catholic Cemetery. In the Allen County Genealogical Society of Indiana Members Only Section the December 2007 Allen County Lines newsletter on page 35 by Alyce J. Morow has an article " The Silent Cities " discussing the history of early burial grounds in Fort Wayne. A few of the larger cemeteries have modern staffed offices with a mailing address, phone number, computers, digitized records, or web sites. Individual cemetery information is shown on our township pages. Most cemeteries have signs, are visible from the main nearby road, at a crossroads of two or more roads, and are often visible in satellite photos on Google maps linked from each cemetery. Cemetery visits should follow the genealogists preferred practice of Do No Harm . Cemetery Etiquette: What you Need to Know for that Cemetery Trip by Pan Velazquex published November 4, 2013 on the Ancestry.com blog. A volunteer using improper gravestone cleaning techniques before taking photos to upload online sparked outrage in August 2014. A good article condensing information and linking to several other good discussions is Please, Please, Please treat cemeteries and tombstones with respect! published August 14, 2014 by the National Genealogical Society. Reading Stones on CCUS, Cemetery Conservators for United Standards, shows various Do No Harm Methods for Reading Grave Markers. Foil Casting is one easy and harmless method you can use to read hard to decipher tombstones. Using aluminum foil instead of chalk rubbings to read old tombstones with photos discussed February 4, 2017 on Grave Topics: Cemetery Art, History of Facebook. Until 2001, it was legal to farm through cemeteries. Today, that would be illegal... Indiana now has a law which protects archaeological and human burial sites . ... All sites with artifacts dating before December 31, 1870 are protected, even on private property. Copied with the broken tombstone in the corn field stubble photo posted March 16, 2019 by the Indiana Division of Historic Preservation & Archaeology on Facebook. Click the date link or photo to read the responses to Comments about how this happened and what has changed. Jeannie Regan-Dinius, Director of Special Initiatives, phone: (317) 234-1268, email:jrdinius@dnr.IN.gov, Indiana Department of Natural Resources, Facebook: Indiana Division of Historic Preservation & Archaeology presented A Grave Matter in Indiana August 26, 2017 at the The Genealogy Center at the Allen County Public Library in Fort Wayne, Indiana. She provided a list of Indiana laws covering Indiana cemeteries mostly enacted since 2001. Any cemetery activity prior to 2001 had very little law protection that would apply to any past events. Any questions regarding cemeteries should be addressed to her. A permit is required from her office to probe for buried tombstones along with cemetery land owner permission. Written permission is always best. A growing online tool is the Indiana State Historic Architectural and Archaeological Research Database SHAARD that has surveys, GPS co-ordinate data, and photos of all known cemeteries in all 92 Indiana counties. The main issue with cemetery law enforcement involves understanding who owns the land, whether and when the land deed discusses the existance of a family or church cemetery, and whether the deed provides public access, ingress/egress, or requires private owner permission to even visit the cemetery. Permission to visit a cemetery is decided by the land owner as is photographing tombstones and tombstone cleaning if allowed. Land ownership determines what response to expect from local authorities such as the county prosecutor and/or township trustees to enforce current laws as they apply to the owner when so many day to day tasks already require officials limited time and resources. Their Master Name Index with a Search box on each of their pages lists over 165,000 tombstone photos and transcriptions for over 219,000 people started in 2008, and finished in 2013 for their Allen County Indiana Cemetery Project. The Mary Penrose Wayne Chapter NSDAR recorded most cemetery tombstones in 1932. For some older inactive and missing cemeteries those are the only known records. In the 1980's the Allen County Genealogical Society of Indiana ( ACGSI) updated and transcribed the visible tombstone names into township publications. Several family cemeteries and many tombstones visible in 1932 were no longer found in the 1980s. The DAR used this updated 1980's ACGSI list along with their 1932 tombstone readings to locate all current tombstones for photographing. ACGSI has a Cemetery Name Only Index and the The Genealogy Center at the Allen County Public Library in Fort Wayne, Indiana has digitized some of those indexes. Digital copies of the ACGSI 1980s tombstone readings are available in the ACGSI Members Only Section of their web site. See Citing images from Find A Grave discussion on Evidence Explained. The Indiana DNR (Department of Natural Resources) has maps, GPS latitude, longitude and photos for most Allen County, Indiana cemeteries on their Allen County SHAARD Cemeteries pages. Indiana DNR also has Symbols in cemeteries short list of common tombstone symbols. What is a sexton? An employee or officer of a church who is responsible for keeping records of those buried in the cemetery, for the care and upkeep of church property and sometimes for ringing bells and digging graves . The hard part can be finding existing records for cemeteries without an office. For cemeteries still accepting burials there will often be a sign with contact information. If no contact information or office listed, then ask a nearby Funeral Home, business (based on my persional experience, even a tractor supply, or barber shop could have the records), or any neighbor close to the cemetery might know who has the original sexton records. Read more info at Teach Me Genealogy - What is a Sexton?. USGenWeb has an Allen County Tombstone Transcription Project. The 1919 Sears and Roebuck's Tombstone and Monument Catalog is a video by Words From Us on Facebook. From Quarry to Cemetery Monuments Ordering Monumental / Cemetery Stones from Catalogs / Price Lists, etc. on Stone Quarries and Beyond has lots of links to more information. 7 Records to Look for in Cemeteries by Joy Neighbors published August 3, 2107 in Family Tree Magazine. The business of body snatching in Indianapolis by Dawn Mitchell published May 1, 2016 on the IndyStar.com. Who cares for pioneer cemeteries? The DNR - Department of Natural Resources Cemeteries web page has information and links to Indiana cemetery laws and information. The Indiana Pioneer Cemetery Restoration Project is a good volunteer source of information. Follow discussions on their Facebook page. Cleaning Products That Do No Harm at Cemetery Conservators United Standards.org. Flag-Folding Procedures traditional method from The American Legion. Grave Concerns with video discusses grave robbing when In 1879 five physicians founded the Fort Wayne Medical College in the old Hugh McCullough mansion on Superior Street. Students were required to pay tuition, study hard and provide their own cadavers for dissection. The need for medical cadavers inspired the very lucrative profession of grave robbing and no cemetery within fifty miles of Fort Wayne was safe. by Eric Olson, 21Country Featured Reporter published November 13, 2018 on WPTA21 ABC TV station. History’s Best Strategies for Avoiding Being Buried Alive These ingenious 19th-century techniques aimed to make sure dead really meant dead by Ashawnta Jackson published October 10, 2017 on AtlasObscura.com. Photo of tombstone advertisement in early 1900s Sears catalog posted March 31, 2018 in Cemetery Conservators For United Standards on Facebook.